Keep your kids engaged during a visit to the Vatican on a 3-hour private tour designed for families. 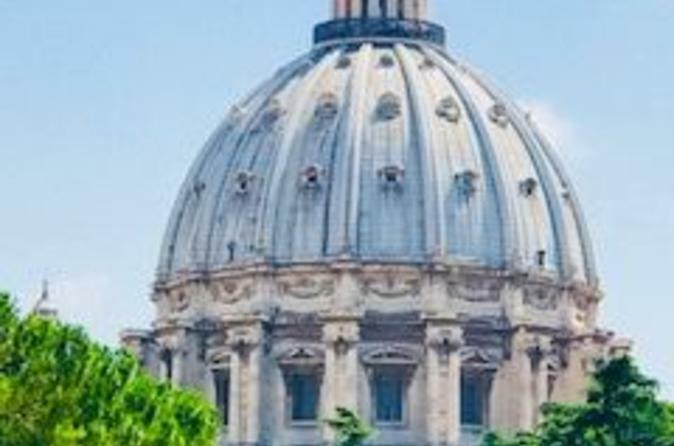 With a kid-loving guide, you’ll tour St Peter’s Basilica and the Vatican Museums, including the Sistine Chapel, to learn about the history of the site and see its renowned collection of art by masters like Michelangelo. Walk at a pace that suits your family, and enjoy visual aids from your guide that bring to life the wonders of the Vatican, entertaining and educating your children at the same time. Skip-the-line admission is included! and 8 year olds. Good choice of rooms to visit in the museum. Main challenge was the crowds, which the guide cannot control. We had a wonderful private tour with Angelica from Vivicos International Travel. The tour was just for myself, my husband and my 11 year old son. The tour was well-paced and included the Vatican Museum, the Sistine Chapel and St. Peter's Basilica. Angelica was enthusiastic, warm, incredibly knowledgeable, kept us all engaged and tailored the tour for us, giving us choices along the way. For example, she gave us the choice of going to the gallery containing all of the papal vehicles, which we really enjoyed. She also brought an ipad to show us images of the different popes, what the white marble sculptures must have looked like when they were still colorfully painted, etc. We cannot recommend Angelica highly enough. We had our tour with Matteo yesterday and it definitely lived up to our expectations! He kept our 10 and 13 year old engaged while expertly guiding us around the very large and crowded Vatican museums. Our visit without him would have been very frustrating, we managed to get an excellent overview in 3 hours which was probably the max for our kids. He was informative and friendly...overall it was money well spent! Our guide was exceptional and connected well with our ten year old, making a tour of the Vatican interesting and engaging, with great little titbits that included history and personalities of great artists and the different popes. Needless to say that the adults learnt something as well. Ask for Angelica she is knowledgeable and has children of her own - so great with children. But man was the Vatican packed so at times it was hard to navigate with small children. Our guide was great trying to keep our oldest (5) entertained and engaged in the tour. Was able to answer any question we had. I loved the tour, Lisa or Alisa I can't remember her name.. She was awesome, she made this experience unique and unforgettable for my son (12) and Daughter (4) She involved them so much they felt comfortable asking question and she was able to answer all of them. My son wanted to see the prior popes were buried and she offered to show us right away. We were able to get holy water and we even got tickets to be part of the pope's audience. I think she went the extra mile to make our experience fabulous. I would recommend this tour and specially with her as a tour guide. Best investment.. There is so much to see at the Vatican that it can easily be overwhelming; but Ilaria strategically toured us through to see the highlights - specifically geared towards our kids (which still took over three hours). She kept our 6 and 9 year old boys interested throughout - which allowed my wife and i the freedom to also enjoy the tour! It's expensive, but worth it. We booked this tour keeping in mind our 5 yr old daughter who would be having such a experience for the 1st time!AnnaLisa our guide was amazing beyond words. She kept my usually shy girl engaged for 3 full hrs! Telling her the history about the Vatican and the Sisten Chapel in story form! Playing I Spy with her to keep her engrossed and excited,drawing for her! So much so we as parents too had so much fun! AnnaLisa was very informative patient and friendly! My daughter drew her a picture as a thank you in the end! We knew my girl absorbed everything when she was talking to her grandmother and telling her some bad people killed St. Peter and buried him!!! That the pope who is higher than the king lives in the Vatican City! We could not have asked for a better guide than AnnaLisa!!! Highly recommend her! Vivicos Travel, Rome truly organised the best guide we could hope for- Manuela. 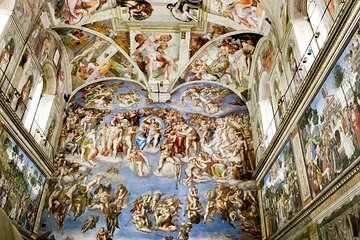 She brought the Vatican galleries, the Sistine Chapel and St. Peter's Basilica to life for us. Despite the thronging tourists, Manuela ensured that we had detailed and intresting explanations for everything that we saw, had enough time to take photographs and spend time lingering at objects of beauty that mesmerized us. She involved the children by asking them many questions and showing them a lot of items of uniqueness and mystery during the tour e.g. paintings and tapestries of individuals that follow you with their eyes, rubbing St. Peter's foot for luck, artists hiding themselves in their own paintings, the messages conveyed in the Sistine chapel, the enormous length of St. Peter's Basilica vs other Catherdals of the Worl etc. Though my husband and I had visited the Vatican several years earlier, it was our first time visiting with our daughters, which is why we wanted a guide who could fully help them understand and appreciate the gloriousness of what they would encounter during the tour. Manuela did just that! We sincerely recommend this tour with Manuela for anyone visiting the Vatican, especially with children or the elderly. As a mother of three, it is often difficult to take your children on tours and maintain their interest. However, our tour guide Laura did a wonderful job explaining the history of the Vatican to me and my children. She was very professional and kind to my kids. I would definitely recommend taking this tour again.